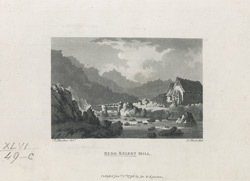 View of the mill at Beddgelert in Carenarfonshire, Wales. Beddgelert is situated at the confluence of the Rivers Glaslyn and Colwyn on Mount Snowdonia. The beautiful scenery of the surrounding landscape is well known and the area has attracted tourists since the 18th century.